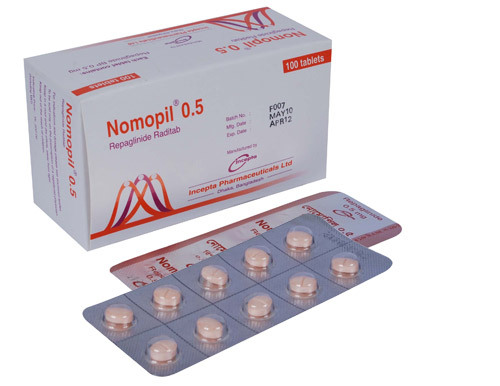 Nomopil 0.5: Each tablet contains Repaglinide USP 0.5 mg.
Nomopil 1: Each tablet contains Repaglinide USP 1 mg.
Nomopil 2: Each tablet contains Repaglinide USP 2 mg.
Repaglinide is an oral blood glucose-lowering drug of the meglitinide class used in the management of Type 2 diabetes mellitus (NIDDM). 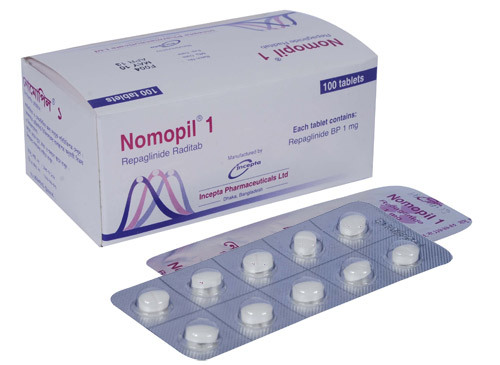 Repaglinide works by causing pancreas to release more insulin into the blood stream which possesses rapid onset of action and rapid elimination. Repaglinide is indicated as an adjunct to diet and exercise to lower the blood glucose in patients with type 2 diabetes mellitus (NIDDM) whose hyperglycemia cannot be controlled satisfactorily by diet and exercise alone. It is also indicated for use in combination with Metformin to lower blood glucose in patients whose hyperglycemia cannot be controlled by exercise, diet, and either Repaglinide or Metformin alone. For patients not previously treated or whose HbA1C is < 8%, the starting dose should be 0.5 mg before each meal. For patients previously treated with blood glucose-lowering drugs and whose HbA1C is > 8%, the initial dose is 1 or 2 mg before each meal. Repaglinide should be taken immediately or up to 30 minutes before each meal. Dosage should be adjusted according to response at intervals of 1-2 weeks; up to 4 mg may be given as a single dose, maximum 16 mg daily. 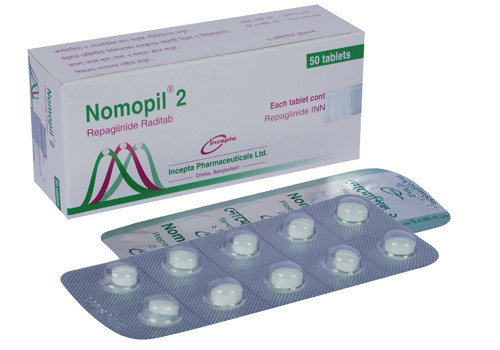 The most common side effects of Repaglinide are hypoglycemia and related symptoms. Others include upper respiratory tract infections, diarrhea, constipation, nausea and vomiting. Hypersensitivity reactions include rashes and urticaria. Insulin should be substituted during concurrent illness (such as myocardial infarction, coma, infection, and trauma) and during surgery. All oral blood glucose-lowering drugs are capable of producing hypoglycemia. Repaglinide should be administered with meals to lessen the risk of hypoglycemia. Safety in pregnant women has not been established. Repaglinide should be used during pregnancy only if it is clearly needed. It is not known whether Repaglinide is excreted in human milk. Because many drugs are excreted in human milk and because of potential for serious adverse reactions in nursing infants from Repaglinide, a decision should be made whether to discontinue nursing or the drug, taking into account the importance of the drug to the mother.